New Delhi : Vikram Solar today said it has signed an MoU with Israels Water-Gen to develop clean and hygienic drinking water solutions in the country. “The technology developed by Water-Gen to create and store drinking water by harvesting condensation from air, provides a potential solution to the clean and safe drinkable water crisis faced by India,” Vikram Solar said in a statement. According to the statement, the larger objective of this collaboration is to make available drinking water to the remote locations of the country using its rich natural resources ? air and humidity. The cost-effectiveness of the technology is an added bonus that will help make the solution available to the masses. Combined with Vikram Solar?s technological prowess and expertise in the solar power domain, the attempt is to conceptualise a product most suitable for the Indian market requirements, it said. 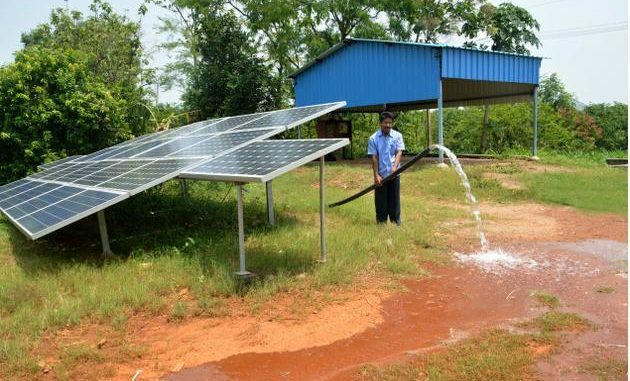 Incorporating use of solar power into the Water-Gen technology is expected to further enhance the energy efficiency and availability of power for the technology in remote locations, through use of solar panels, it added. “We are happy to collaborate with Water-Gen to see how we can merge the 2 products ? solar and water, into a single offering and make it Renew, Restore, Revive, Refresh, and therefore Re-focus on building lives sustainably,” Gyanesh Chaudhary, MD & CEO, Vikram Solar said in the statement. Under the MoU, Water-Gen will share their technology and know-how with Vikram Solar to manufacture the products in India. Vikram Solar will be responsible for developing and managing the manufacturing, sales, marketing and distribution of the products. Initially, Vikram Solar will develop three categories of the product catering to industrial, commercial utilities, and residential segments. There would be further plans to establish a Research & Development centre in India for the same. Vikram Solar plans a minimum investment of USD 100 million for the endeavour, it said. Water-Gen has systems that can produce up to 7,000 litres of clean drinking water a day depending on temperature and humidity conditions.